Ferrari seized the first win of the season when Sebastian Vettel jumped pole-sitter Lewis Hamilton during a fortuitously timed pit stop under virtual safety car conditions. Hamilton started the race with the disadvantage of having his teammate, Valtteri Bottas, start from P15 after a qualifying crash, meaning Vettel and his Ferrari teammate, Kimi Raikkonen, could strategically outfox the Mercedes driver with their sole pit stops. 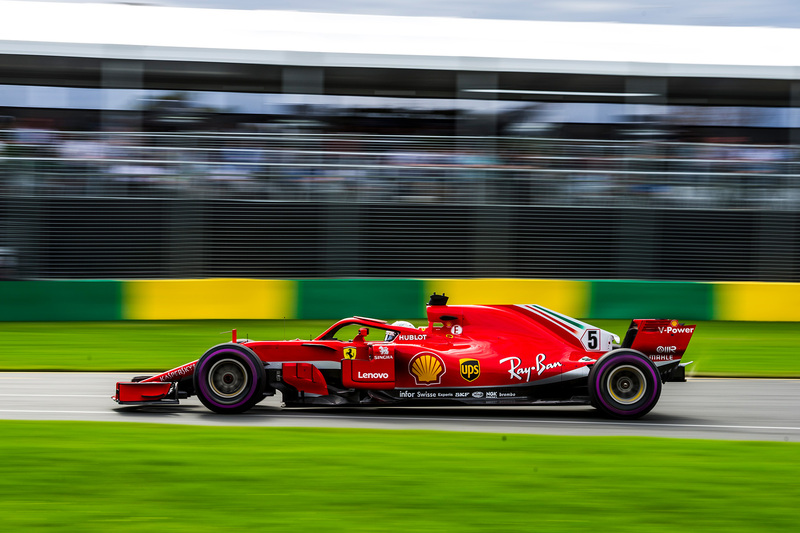 Hamilton led Raikkonen and Vettel from the lights in qualifying order, and though Kimi followed the Mercedes driver closely for 18 laps, he couldn’t make a pass around the Melbourne circuit that makes overtaking particularly difficult. Ferrari rolled the dice and brought Raikkonen in, switching from the ultrasoft to the soft compound. Hamilton had no choice but to follow suit on the following lap to cover off the move, and the pair held their relative positions. But Vettel extended his stint on the softer tyre to stretch his inherited race lead and end the grand prix on fresher tyres. On lap 26 the opportunity to jump Hamilton fell into Vettel’s lap. Romain Grosjean’s Haas stopped on track, activating the virtual safety car and forcing all driver to slow down. Vettel took his moment to stop for fresh soft tyres, and as he exited the pit lane he edged ahead of the Mercedes at turn one, taking the lead. Hamilton harried the scarlet car for most of the rest of the race, but to no avail, and in the final few laps he dropped back from Vettel, his tyres shot and his quest over. “We got a bit lucky with the safety car, but I really enjoyed it,” Vettel said on the podium. Vettel admitted too that the Ferrari probably wasn’t the best car on the track this weekend. “It was a lucky race, but we’ll take it,” he said. Hamilton was gracious in defeat, lamenting the difficulty in overtaking on the Australian Grand Prix track. “It’s been an incredible weekend,” he said. “Big congratulations to Sebastian and Ferrari. “Today obviously they did a better job. We’ve got to go back to the drawing board and work on it. “This is an awesome circuit, but it’s so hard to overtake on, so at the end I was really living to fight another day, save the engine. Kimi Raikkonen clung onto third place from a resurgent Daniel Ricciardo, who started from eighth place but rose up the order thanks to retirements ahead of him and some decisive overtaking manoeuvres. The Finn noted that his teammate was the recipient of better luck and that the result could have been different had the safety car not intervened. “I think it was okay,” Raikkonen said. “We didn’t have the most luck, but what can you do — luckily Seb got the luck, it was our team at least. Australian Ricciardo had to accept fourth place and another year without a podium in his home race. Fernando Alonso made a welcome return to the top five after years of toil with Honda engines. The Spaniard started from P10 and benefitted from retirements ahead of him, but he was forced to soak up pressure from Red Bull Racing’s Max Verstappen for much of the race. Verstappen started from fourth on the grid, but he was jumped by Haas’s Kevin Magnussen on the first lap. The Dane held Verstappen at bay, frustrating the Dutchman into a spin on lap 10 that lost him three places, including to Romain Grosjean and his own teammate, Daniel Ricciardo. Verstappen gained both places lost to Haas when both American cars stopped on their out-laps after their pits stops, apparently due to cross-threaded wheel nuts, but he lost a place to Alonso when the McLaren driver made his stop under the virtual safety car. Nico Hulkenberg scored six points for Renault from seventh place, holding back Mercedes’s Valtteri Bottas, who started from P15 and was making slow progress up the field. Stoffel Vandoorne followed Bottas over the line by less than half a second, and Renault’s Carlos Sainz scored the final point of the grand prix. Force India’s Sergio Perez and Esteban Ocon, Sauber’s Charles Leclerc, Williams’s Lance Stroll and Toro Rosso’s Brendon Hartley were the only other finishers.